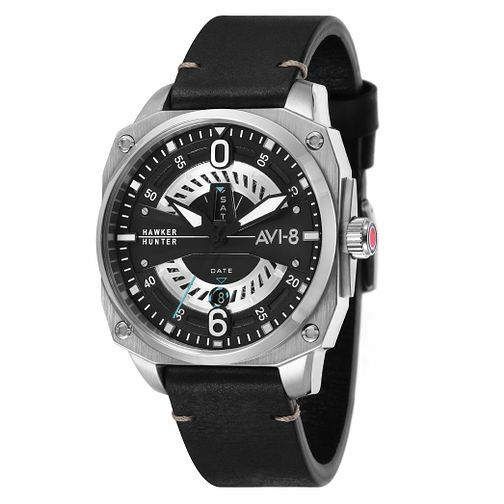 With the bold cockpit-inspired case design, the Hawker Hunter remains a timepiece forged out of true avionic design detail. Carved and forged out of marine grade stainless steel and measuring 42mm in diameter, the watch opens up at the lens to display a unique dial design that echoes the machine engineered elements of the Hunter’s breakthrough jet design engine. Masking the date and day display, the serrated turbine-inspired layer of dial application adds a magnificent amount of depth and complexity. Both day and date fonts have been reprinted to pay homage to 50s and 60s typography found on Hawker Hunters of the time. Bold hour and minute hands read the time with clarity and precision with a contrast colour detailing on the seconds hand. The crown guard to the right of the watch references the front view of the Hunter’s intakes. Hugging the watch to the wearers wrist is a vintage designed hand stitched leather strap which marries perfectly with the neo-classic aviation styling.